Does your home feel drafty and chilly? Are your walls cold to the touch? If so, then your home may be lacking insulation in the walls. 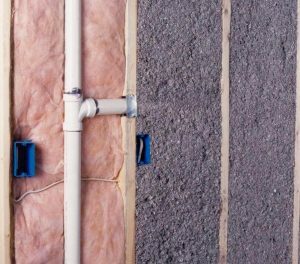 In fact, most homes built lack sufficient wall insulation, not to mention when a home does have insulation it’s usually fiberglass batts which allow air to pass right through them. With a process called dense packing, cellulose insulation is pneumatically installed at high velocity to densities greater than 3.5 pounds per cubic foot, it acquires a unique air sealing property. In this process, the material behaves as a liquid, flowing into obscure bypasses and solidifying them. Dense Packing (DP) solves air movement problems critical to building performance that would be impractical to access or repair in any other way. So it is a pillar of weatherization practice and indispensable to the revitalization of older homes and buildings. 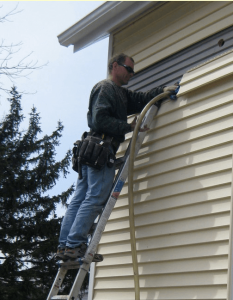 It is usually performed from the outside by removing strips of siding and drilling holes into your walls. Building cavities are dense packed by inserting a pipe, tube, or hose down the entire length of the passage. A powerful insulation blower delivers a lean mixture of cellulose and air at about a hundred feet per second. Initially the cavity is pressurized with a cloud of insulation. The air flows out through every crack and pinhole carrying fine particles of insulation. The holes are clogged with insulation until they stop flowing and the cavity fills with a loose pile. Then the cellulose chunks charging down the tube start to slam into the loose pile and pack it. When it becomes very tight, it plugs the end of tube and stalls the insulation blower. The tube is quickly pulled back until the tip finds more loose insulation. The flow and packing process starts again and this continues until the entire cavity is solid. Now this part of the building shell is an efficient part of the thermal envelope. The area is insulated to a real R-3.8 per inch because there is a real pressure barrier built into the assemble to stop airflow and protect the insulation. Building cavities subjected to wind, stack, or mechanical pressure move enormous amounts of conditioned air. Common insulation methods do little to stop this flow, so the insulation performance is degraded, and the larger convective heat losses continue. DP forms a perfect injection molded block in these cavities that stops the air movement and delivers real control of conductive heat loss too. Thermal renovations to old buildings typically produce startling changes in performance. The effective leakage area in old houses are typically reduced by 40-70 percent just by dense packing the hidden framing bays. This results in actual ventilation reductions of 50-90%. Tremendous fuel reductions result. But the collateral improvements are often more important. Buildings that were formerly impossible to heat now become stable, comfortable and highly efficient living and working spaces. With no diffusion barrier to trap moisture, DP helps to preserve the shell of the building. Cellulose fiber is highly absorbent and actually wicks moisture content out of framing members. This stabilizes the interior plaster and exterior paint by buffering the water load forced into the shell through the heating season. And by blocking all the paths for warm, moist air to blow into the framing spaces, they are relieved of 98% of the load right from the start. DP insulation is an important element in fire safety. Typically, fire destroys wood buildings by entering and traveling through the framing bays. Once walls start to act like chimneys, the studs are quickly consumed. Blocking or fire stops are known to be effective in preventing the spread of fire from floor to floor and ultimately into the attic. DP behaves as continuous blocking in walls because the framing is really solid. In fact, test buildings with DP walls are virtually impossible to destroy by fire.